Made from cornstarch, Nuudles are safe, non-toxic and completely biodegradable. Simply dab a Nuudle on a damp sponge or paper towel to make its own glue. 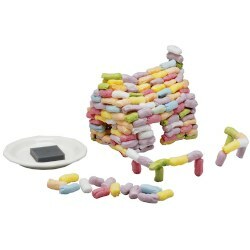 Great for making dinosaurs, people, houses...the possibilities are endless! 900 to a 1000 Nuudles. 3 years & up. The revolutionary building material that teachers and kids love! 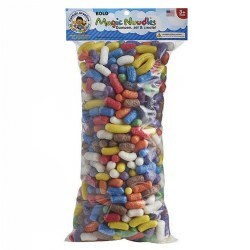 Made from cornstarch, Magic Nuudles are safe, non-toxic and environmentally friendly. Just dab a Nuudle on a damp sponge and push it against another Nuudle to create anything imaginable! Nuudles also magically stick to paper, glass, cloth, or skin. Clean up is fast and easy since Magic Nuudles dissolve down the drain under running water. Quantity varies between 500 - 600 nuudles in various sizes. 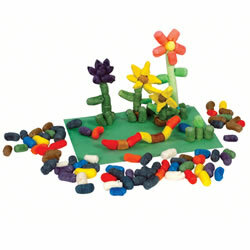 Made from cornstarch, Nuudles are safe, non-toxic and completely biodegradable. Simply dab a Nuudle on a damp sponge or paper towel to make its own glue. Great for making dinosaurs, people, houses...the possibilities are endless! Set includes approximately 500 Nuudles. Made in the USA. 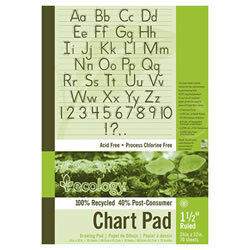 100% recycled paper is padded and taped to a heavy chipboard back. Each pad is 5-hole drilled to fit any stand. Recycled and Recyclable! 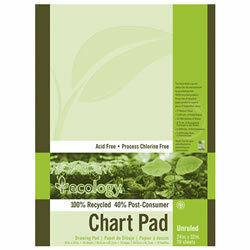 Generous 70-sheet pads mean ordering less often. 24" x 32".